The series 181 Ruger Mini-14 rifle has remained a very popular rifle with hunters, outdoorsmen and women, and for home defense. Adding a scope mount and magnified scope or red dot sight is a great addition to your Mini-14. The GG&G Mini-14 Side Mounted Scope Mount provides a solid and rugged mounting base for your optic. Fits Mini-14 series 181 and newer Non RANCH RIFLE models. No gunsmithing or modification needed to your Ruger Mini-14. Bolts to the side of the receiver with a new replacement bolt stop cover plate. 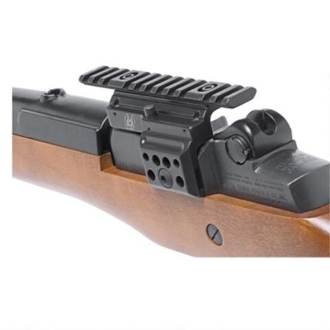 The mounting rail is adjustable allowing for alignment with barrel and receiver. Includes the all important extended bolt hold open button. Features a dual locking screw leveling system. Package includes all necessary mounting hardware and tools. Mounting rail is manufactured to MIL-STD-1913 specifications. Mounting rail is 5 ¼" long. The Mini-14 Scope Mount is designed as a "See –Under" type allowing use of iron sights. All edges have been deburred and softened to protect the shooter. Material: Precision CNC machined from 6061 T6 Aircraft Grade Aluminum. Finish: All aluminum parts are Type III hard coat anodized in a non-reflective matte black mil-spec finish to provide outstanding durability.